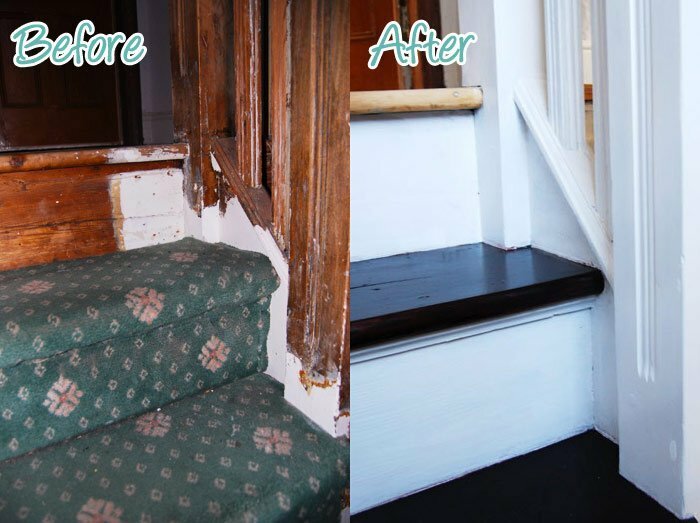 DIY Duel: Staircase Restoration – It’s done!!!!! After months and months of staircase restoration work and countless updates, the day has finally arrived! Can’t believe it – well neither can we – but our staircase restoration project is finally completed. Bet you never thought we’d say that! I still can’t stop jumping up and down and running into the hallway to stare at our finished staircase, so please excuse us if there are even more spelling mistakes than usual (typing and jumping at the same time is surprisingly difficult). Let’s start right back at the beginning. This is what our staircase looked like when we moved in. Not a pretty sight, is it? The spindles were boarded up and everything had been painted so many times, that most of the detail in the wood carvings had been lost – not to mention our whole hallway being brown and green. One day not long after moving in, the brown started to get me so down, that in a complete fit I painted everything white to brighten the place up. It only took a few hours and makes such an amazing difference, but when Jan came home from work the day I finished painting he didn’t notice a difference! Can you believe it?! Eventually everything will still need skimming but for now, it will have to do. Okay, so the walls may look slightly better, but the rest is still awful. The carpet really wasn’t to our taste and I even fell down the stairs twice just because it was so worn and slippery. There were chips all over the painted wood and everything was really dirty and had started to turn yellow. After removing the boards and lots of hours of stripping and sanding, things actually looked worse than before! I’m not sure what kind of paint had been used for the spindles, but it kept going really sticky when trying to strip it with the heat gun. It went everywhere and was a complete pain to remove. If we’d thought that the stripping had taken a long time, we really weren’t prepared for the amount of time it would take for the sanding. You can catch up on the details of lots more sanding, stripping and a lot of painting in our previous posts which we’ll be linking to at the end of this post. But now for the moment, you’ve all been waiting for! Drum roll, please… here it is – our finished staircase! Although the steps are stained a very dark brown mahogany colour, the hallway is much brighter. Everything is so much cleaner and neater. We’re really happy with how the panelling turned out, too. 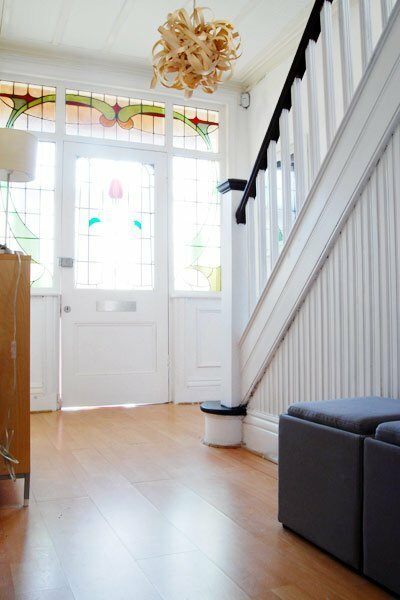 We love the contrast between the dark steps and white risers. The handrail is stained the same as the steps, but we’ve waxed it instead of varnishing it. The hallway floors, especially the upstairs one, both still need sorting. At the moment we’re planning on sanding the original floorboards. Considering the state our staircase was in when we started the restoration, we’re amazed that it has turned out so well. As it’s taken us a ridiculous amount of time to complete this job, here are a few stats just to show how involved this project actually was. As always here are our side by side before and after shots. Isn’t it amazing what a difference bit of hard work and paint can make? The spindles are so much better now! Everything took such a long time to strip, sand and paint, but looking back at what it used to be like it was so worth it! The whole hallway feels completely different! We’re so happy it’s finally completed! We’re still planning to have a runner installed, but haven’t been able to decide which carpet to go for. You can read about our carpet options here. Part 3 – Sanding, again! Have you ever started a project that seemed to take for ever to complete? 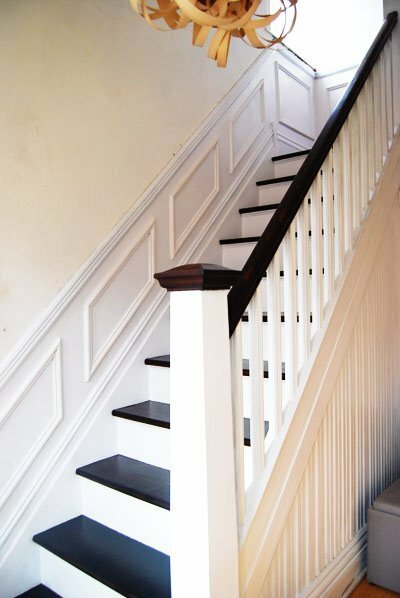 Have you ever restored a staircase? What do you think of our restoration? Was all of the work worth it? Let us know which carpet we should go for! PS. Since restoring the staircase we’ve now also finished the rest of the hallway! The floor has been sanded, there’s a runner on the staircase and everywhere has been plastered and painted, too! You can see the full before and after pictures in our House Tour! We’ve Crossed Over To The Dark Side! Wow! The before and afters are truly stunning! This looks great and was well worth your hard work in my opinion (I can say that since I was not the one who actually had to do it…). Awww, thank you! So happy it’s finally completed. Yep, it was worth all of the work, although I’m not sure I would have said that about half way through when I was covered in dust and paint! Amazing difference. You did such a good job. You can be proud of yourself and rest a little while until next project! Holy cow! I love the finished stairs and the entry with that amazing stained glass. You should be very proud of that. I just saw the finished project on Ugly Duckling House and now I am going to go back through and read all your posts about this. Very cool. Thank you Anne! It was a lot of work, but so worth it! Epic! And I can’t wait to run up and down it myself. :) And see what it looks like with the Rainbow runner! Enjoy the results of all your hard work!! So happy! Can’t wait for the runner as it will really finish things off. The steps are a bit slippery at the moment, too. Wow! How fantastic! I am sad that we have horrible stone stairs and can´t do something like that! It was really worth the work! I am proud that you are my sister! Awww… thanks! You’re stairs look so much better than before. We’ll have to house crash your home so that everyone can see the amazing transformation you’ve achieved! Over from the Ugly Duckling’s. I don’t think I have ever seen quite that baluster detail, you must have been very happy to discover that. wow! 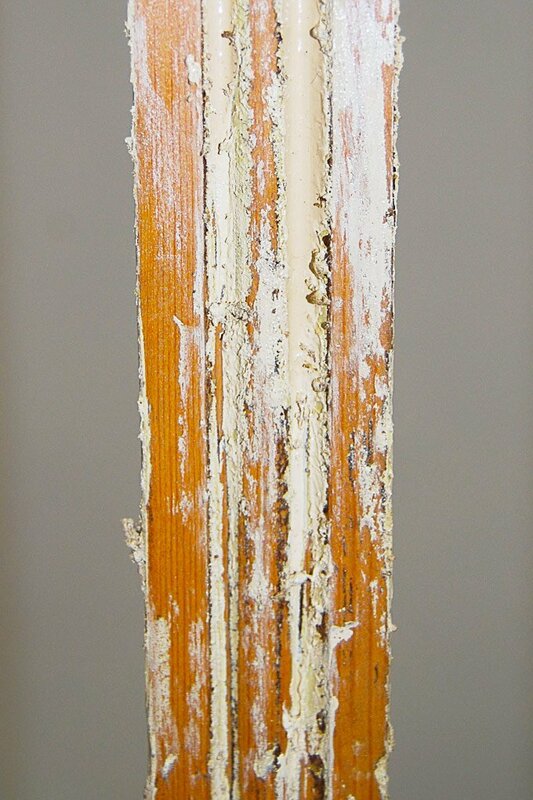 and from someone who isn’t unfamiliar with stripping balusters … with a paint key. Now … How I love thee? Let me count the ways. I too love the dark and light (new flooring at least on the landing?) love the chandie and the wow… the stained glass and not to forget how I love me some good looking shadow boxes. well done… all the way around. you have one good looking foyer there. cheeers. Thank you for your kind comments! Now the staircase is finished we should probably start on the rest of the hallway. WOW what a completely awesome transformation! I love everything you did. What a perfect stain you used on the threads and hand rail. Absolutely beautiful!!! Thanks Katja! I fussed for ages deciding on the colour of the stain, so glad you like it! I can’t say it enough…WOW, MY GOODNESS WOW!!!!!!!!!!!! It is amazing!!!!!!!!!! Your hallway and stairs are so beautiful and elegant!!! The whole entrance way is gorgeous. Was it worth it????? YES!!!! You forgot to mention how many bottles of wine were consumed during the renovations. I’m doing the happy dance for you while you’re jumping up and down!!!! Thank you so much! Yep, the work was definitely worth it! This looks amazing! I love the dark treads with all the white!! Thanks Katie! We’re really happy with how it turned out, too. ok, seriously, this is rad. just saw your blurb on apt therapy and had to come over to see more details and i’m in awe. job incredibly well done! Thanks Amanda! So glad you found your way over here and like our staircase! Holy Cow! This is amazing! You should be very proud! Thanks Sandra! We’re really happy with the result and soooo glad that it’s finally finished! Hard work, but absolutely lovely result. Love the panelling. The house we’ve bought needs the hall carpet replaced and a bit of tidy up on the wood. It’s a brown thick carpet but its a tad slippy … Oh yep a broken coccyx for me after a slip. We’ll be going for a pale runner carpet but it will be a while before we get to that job. Kitchen first. PS. I lost house of how many times I slipped on the horrible carpet and fell down the stairs. Luckily I never broke anything and certainly didn’t do anything as painful as breaking my coccyx! Outch! So glad you found your way over to us, Amy! We ordered our lead testing kit online (at Amazon). Most of the detailing of our original woodwork and cornise was lost under layers of paint, too. It’s loads of work to remove it all, but sooo worth it! Good luck with your restoration, hope you pop back again soon! What a fantastic job! It looks amazing! 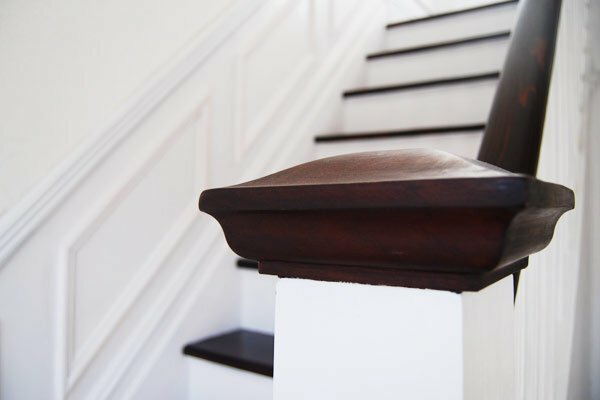 I love your stairs, what product did you use to darken treads and handrail? Would love to do my stairs I just don’t think they could ever look as good as yours. Keep up the good work. Thank you, Bea! We used a Fiddes Non-Grain Raising Stain in Mahogany to stain both the treads and handrail (I think we applied two coats). 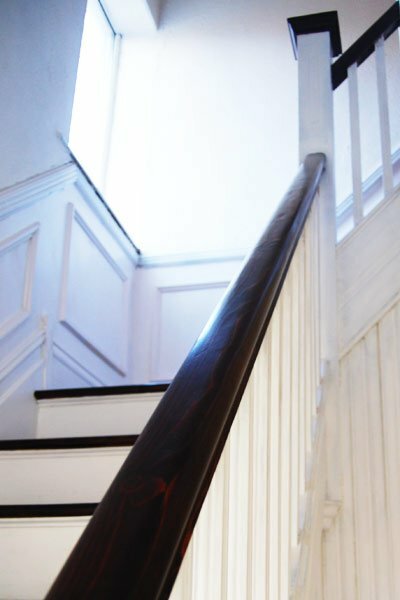 The handrail was then waxed & polished and the treads are varnished with Granwax Aquathane Floor Varnish in Satin – which is the same varnish that we used on all floors in the house. Our stairs were a complete mess before starting to restore them. I think everyone thought we were mad and that they weren’t salvageable. It a lot of work, but I’m sure your stairs could turn out just as you want them! I am in the process of sanding down the stairs with 80 grit! Did you sand them again after with 120 grit? Also did you then paint the risers with the eggshell finish paint first then stain the treads? 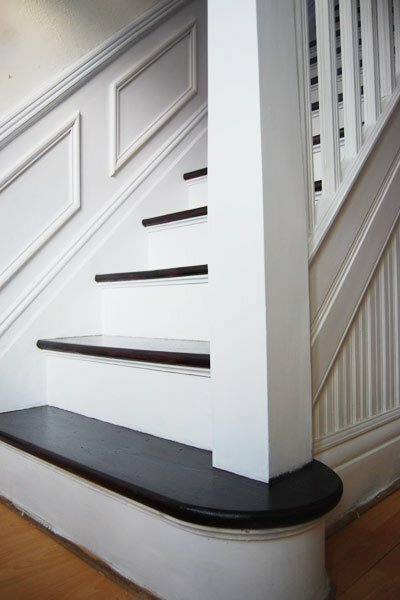 did you put any primer on the stairs beforehand? Afterwards sand the risers again with 240 grit? Wow, that’s a lot of questions! Depending on the state of your stairs I’d be tempted to start sanding with something less than 80 grit and them move on to finer paper. After sanding away all of the paint and old stain with the coarse 80 grit paper we sanded everything again with 120 grit to give a smoother finish. I stained the steps before painting the risers, not sure it makes much difference though. Either way you have to be careful not to get paint on the treads. We didn’t prime the risers as the paint we used was self-priming. Between coats of paint, you will find that the paint doesn’t dry completely smooth and that there are a few airbubbles. That’s perfectly normal and that’s why you should sand any painted surface between coats of paint with minimum 240 grit paper to remove any of those imperfections. The stain colour we used was called Rich Mahogany. Hope that’s some help – always happy to answer any questions! Thank you ever so much Christine!! I need a really good hand lotion after all this sanding lol!! Beautiful job!! 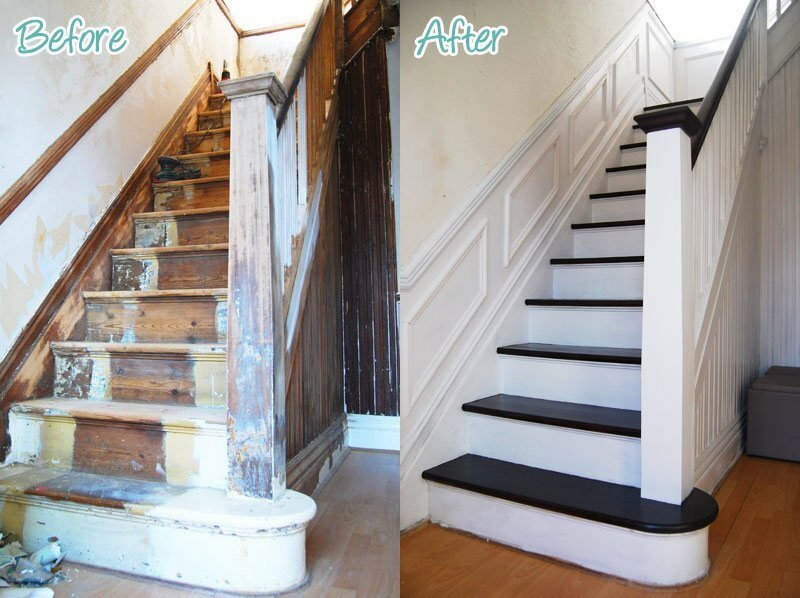 We are looking at restoring our old staircase now – this gives me hope! Thanks, Holly! Our stairs were in such an awful state and still turned out great. I guess it just shows what a you can achieve with a bit of hard work. Hi. Thanks a lot for sharing all your insights. Did you fill the gaps between your floorboards with anything?? A lot of dust undermine that needs sealing off… any ideas??? You’re welcome Fionn! We filled the gaps between the skirting boards and floor (which you can read about here) and insulated under all floors (which you can read about here). Because we insulated under the floors, we didn’t bother filling the gaps between the boards themselves. I’m currently restoring our 1930s staircase and am on the stage of ripping up the carpet and removing the stair treads. Looking forward, I want to stain my tread and paint my risers. We have 3 youngish children and I’m worried about them slipping on varnished stairs. Do you ever slip at all? Love your blog by the way! Thank you so much Helen! Yes and no… but we personally didn’t have any problems, but I would be wary if I had children running around. We have since added a runner up the stairs (we’d always planned on adding one) and it’s something that I would probably recommend. You can read our post about the runner up the staircase here. 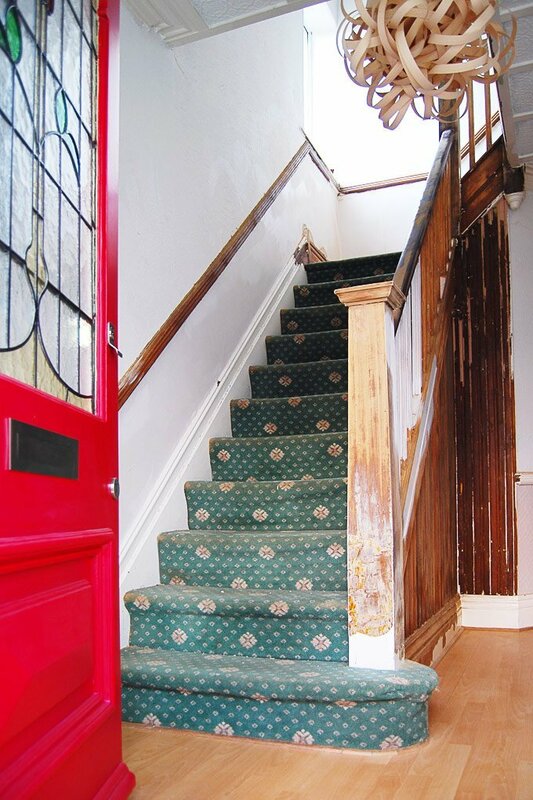 I know this is a pretty old thread now but I was wondering if you have a photograph of where the staircase meets the first floor landing. 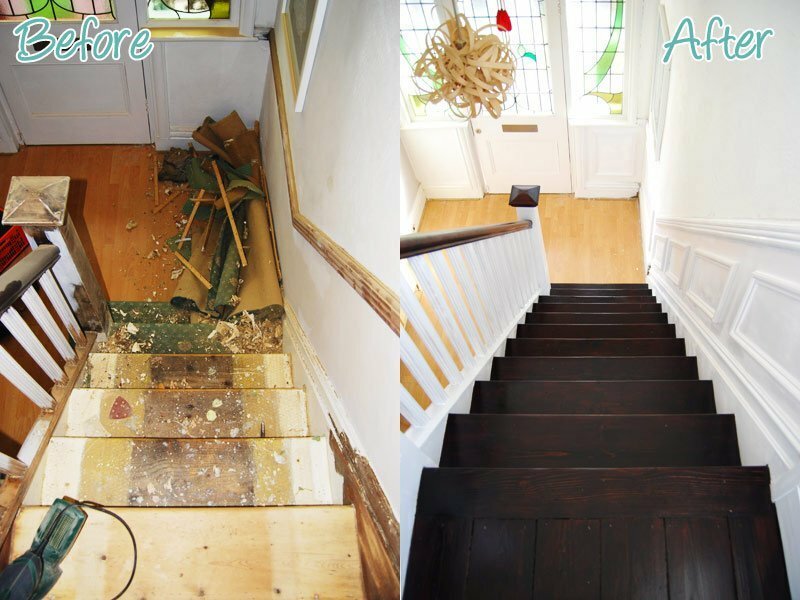 I love your staircase and would very much like to do something similar with ours but I recently stripped the floorboards and sealed them with clear satin varnish and worry about what it will look like if I have dark steps meeting a pine landing – I hope that makes sense. Thanks Cat! We’re always happy to help and I can totally relate to your concerns – we had the same discussion before staining our steps. I’ll take a few pictures and send them to you per email. Hopefully it’ll make it easier for you to decide on what’s right for you! Huge job I’m sure! Can I ask how you got around to painting your staircase high ceiling walls? I have been trying to figure that out on our end without having to rent any extra equipment to do it or hire professionals. I’m currently undertaking a simliar project on my staircase which looks very similar. 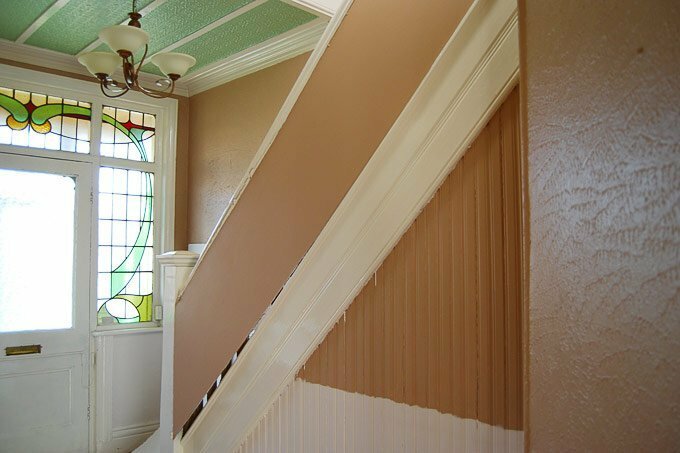 The staircase was constructed in 1885 and has many years of built up paint on the railings and spindles. Although its to late to help you out, hopfully other people who find your page looking for tip will see this. I too was having the same issues with non-toxic strippers and heat guns. The old paint was turning into something like chewing gum and was a nightmare to remove. The secret is ammonia. Older paint especially pre-70’s was many times made with or from buttermilk. Ammonia disolves the buttermilk easily and quickly and it absorbs right into your rag or sponge. After you get through the layers of latex or possibly lead paint use ammoina to dissolve the buttermilk based paint. I can see from the pictures you’ve posted thats exatly what was happening to your project. Wow, that’s something I’d never have thought of trying! Thank you for sharing your experience, Nick. 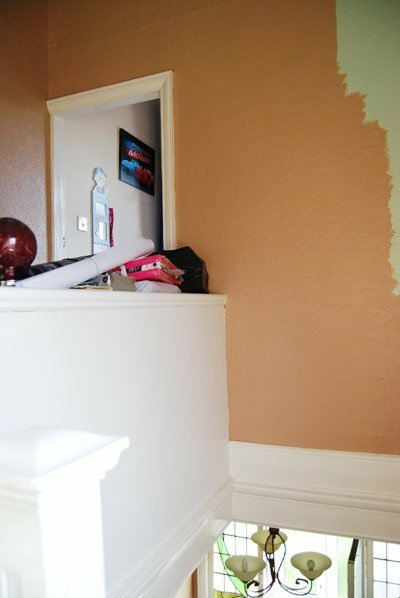 If we ever strip paint again (I have a feeling we will) we’ll definitely give it a try! You done some amazing job! It looks really good! 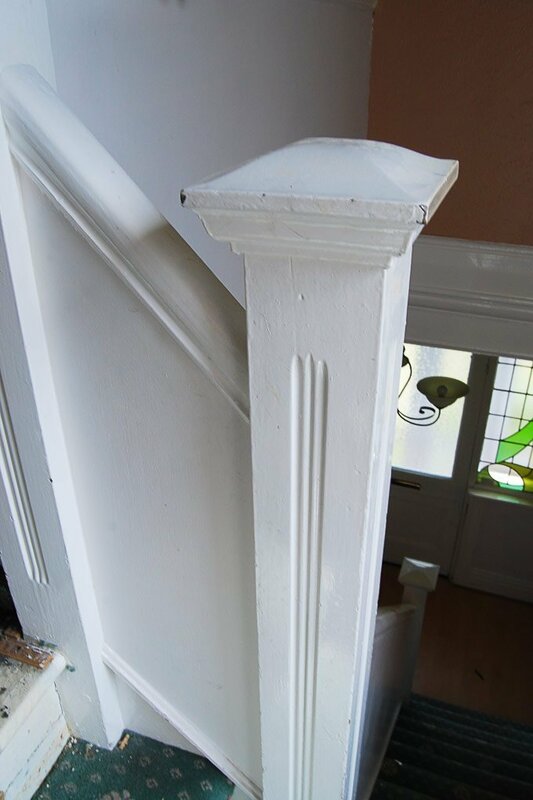 I am on the process of restoring my staircase and the problem i have is that the steps have quite a lot of holes which i have filled with the wood filler and some screws stickin out. Will the Fiddes Raising stain you used cover the screws and filler? Thank you, Peter! The stain will cover the filler but as it has a different consistency than the wood, there will be a noticeable difference to the rest of the tread. The stain, however, won’t cover any screws. I’d recommend testing what you’re trying to achieve on one step first. There’s no point in doing all of that work only to find that you’re not able to achieve a result you’ll be happy with. Ohh, Sandra! You’ll almost certainly have lead paint in a house that’s from the 30ies! You should definitely stop immediately. 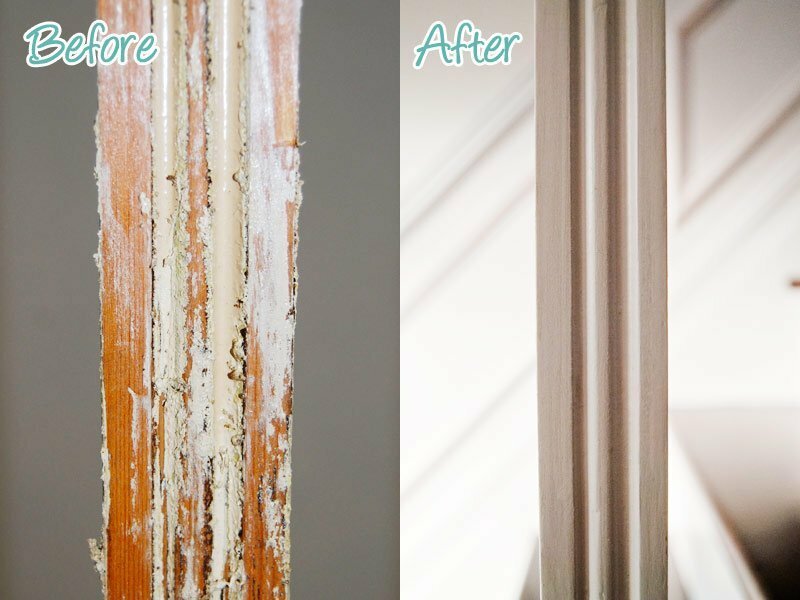 We wrote a post a while ago on how to deal with lead paint. Maybe there’s some information in there that can help you. 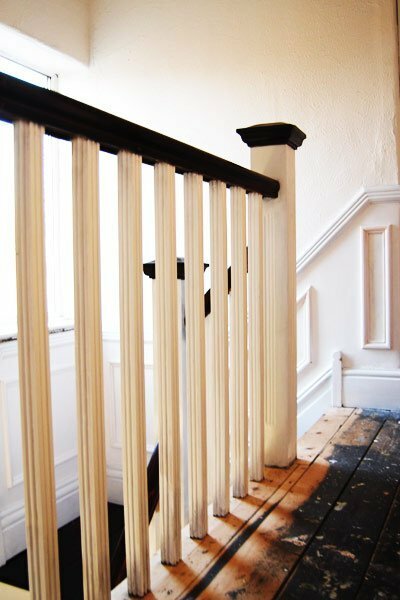 I have moved into a house and uncovered exactly the same stair spindles, the bottom stairs are perfect but l need to renew all the top floor. I have searched the internet. Have you any ideas where l can purchase the same spindles..
It’s unlikely that you’ll be able to find the exact same spindles but there is still an easy solution! We had our original mouldings reproduced and I’d suggest the same for your spindles. 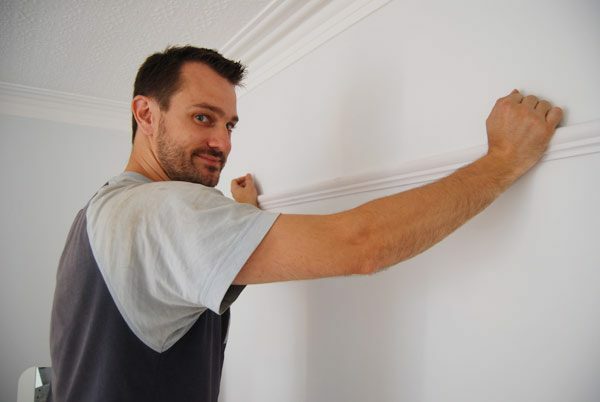 We wrote a post about it which you can read here but basically, we took some of our moulding to a joinery, they made a cutter (which cost around £75) and then made all of our new moulding which matches the original perfectly. The per metre price was about the same as purchasing it from a DIY store and the only additional cost was the cutter. Well done! I know that you suffered through that but the results are so well worth it. Thanks, Vanessa! We’re so pleased with how it turned out, too! I am just about ready to tackle my staircase. I have a 1903 large Victorian in a St. Louis suburb. Overall, the house was in great shape. But the 80’s dark green carpet on the stairs..urgh! I have to have back surgery, so I’m debating whether to tackle before or after. But I’m going to stain the entire staircase and handrails/ballisters, then runner down the center. I got some spray-on stripper that Lowes highly recommended. I also have a detail sander, and lots of sanding sponges. Any other tips? One side question: Did your house have any dips or drops in the flooring? I have dips in my upstairs…some quite pronounced, and I’m not quite sure what to do with those…especially wanting to put hardwood in the rooms. 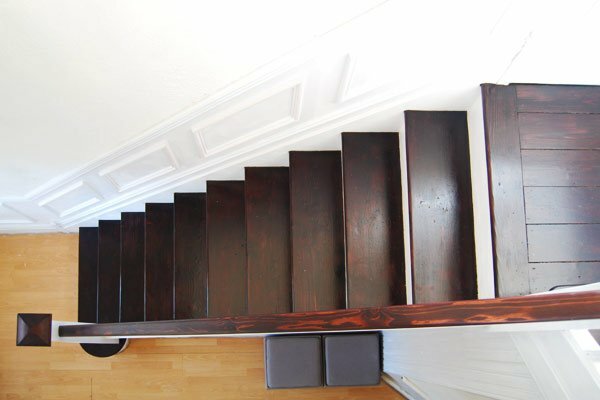 We’re so happy with how our staircase turned out but it is a project that takes a long time (probably longer than you expect) so it’s definitely worth making sure you have enough time to complete it – there’s nothing worse than staring at half-finished projects and not being able to do anything about them! I’d definitely recommend checking if you have lead paint (you can buy test kits at most DIY stores) before you start to strip any paint – safety first! It’s a job that will seem to take forever so just keep reminding yourself that it’ll be worth it in the end! We didn’t have any big dips in our home (we have a few larger ones now) but as long as they don’t bother you too much I think it’s part of the charm of living in an older property. 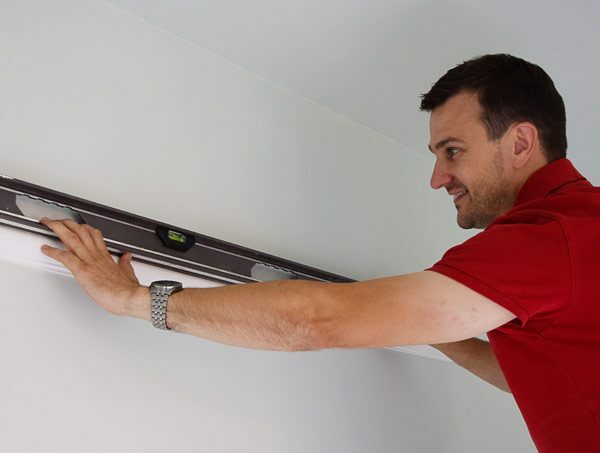 If you do want to remove them you will have to take up the existing floor and adjust the beams beneath by adding strips of timber to level out the structure before adding a new floor on top. Hope that helps & keeping my fingers crossed that your surgery goes well!